Change WebM format to AVI and vice versa with three clicks. WebM or AVI? Which One Would You Choose? AVI, as a mature video format, is favored by users greatly in terms of the performance of video quality, size, compatibility, etc. And WebM is an open, royalty-free video format for use in the HTML5 video tag. If you prefer to uploading videos to websites, WebM is the appropriate video format as it can offer better video quality with the smaller size. People also like convert MP4 to WebM for uploading or something else since WebM is eye-catching in today's streaming media and has even replaced the flash video. Yet, the demerits of WebM are also obvious. It still needs time to improve its popularity and compatibility. So, WebM or AVI? You can choose the one based on your needs. For different purposes, you may need to convert AVI format to WebM embedded on a webpage using HTML5 video tag or convert WebM to MP4 or AVI for free playback on various devices. Without any cost, you can handily deal with the format conversion with the following two methods. Free HD Video Converter Factory can fast change WebM format to AVI and vice versa with three steps by supporting the advanced hardware acceleration tech. Also, you are allowed to compress the large output file with intact video quality. Let alone you can change the video parameters like bitrate, frame rate, encoder, etc via this freeware. 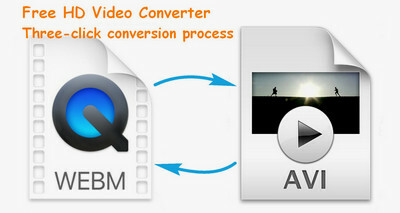 To deal with WebM video to AVI conversion and vice versa, Free HD Video Converter Factory is the recommended program. As an HD video converter, this freeware is capable of importing any mainstream videos and converting them to 300+ formats and devices with three simple steps. It supports Intel QSV, Nvidia NVENC, CUDA hardware acceleration to finish media processing in a faster and easier way. Preparation: free downloadfree download and install it on your Windows PCs then start the video conversion. 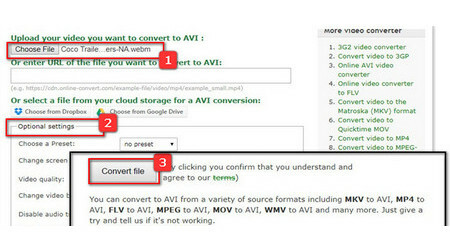 Launch this WebM to AVI converter freeware then load your WebM or AVI videos by clicking “Add Files” or directly dragging them to the interface. Head to the output format section, if you loaded WebM videos, then choose the AVI format under the video tab. But if you loaded AVI videos, choose WebM icon here. 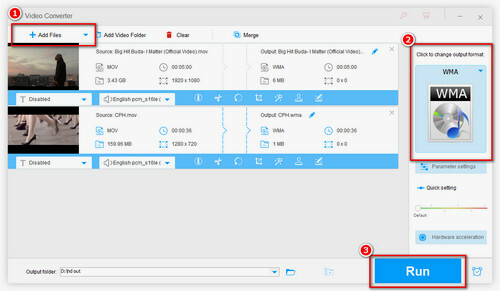 You are allowed to customize the output folder then simply press the “Run” button to launch the video conversion process. 3. (Optional) customize video settings like bitrate, frame rate, etc. You can cut/ rotate/ flip video here. If you do not want to make any change, just let it alone. 4. Press “Convert file” button to upload and convert the file. 5. Wait until the file conversion finishes. Then it will automatically download the converted file. If not, you can click the “direct download link” to save the converted file to local disk manually. Tips: For you who want to change AVI format to WebM online, go to [video.online-convert.com/convert-to-webm] and repeat the above converting process. Note: There’s the maximum file size limit on most of the online converters, and the converting & downloading speed is based on the site server and your network speed. The above two are the simplest methods on AVI format to WebM and WebM to AVI online/offline transcoding. Just take the detailed guide to change your files to the desired formats. And feel free to share this tutorial with more friends. 1: Convert videos to the web supported formats for uploading. 2: Enhance video quality from SD to HD to get better viewing experience.